I'm so excited about the adorable Nightmare Before Christmas Halloween decor that I made this year. They were fun crafts and pretty easy to make as well. 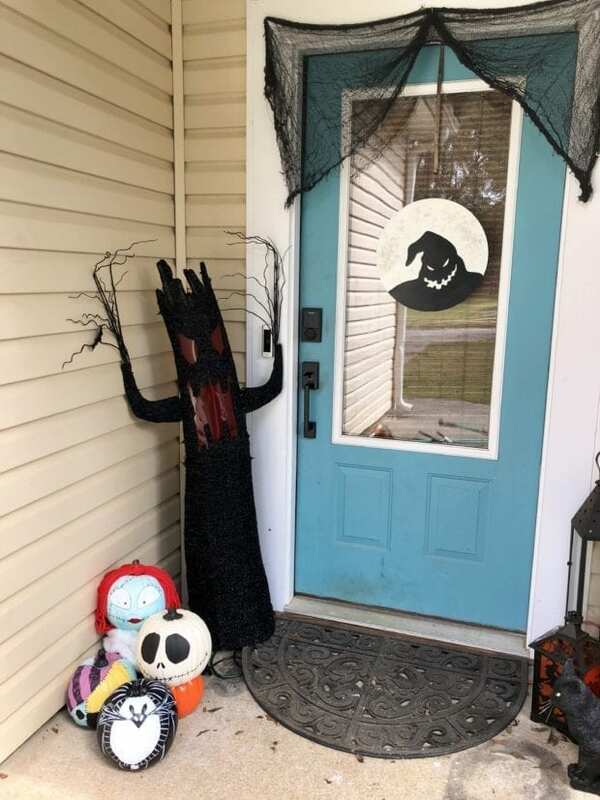 I used a teal pumpkin because we participate in the Teal Pumpkin Project which if you aren't aware of is the way to show you are an allergy friendly house. This gives children with severe allergies a fun way to still participate in the Halloween fun without the fear of having an allergic reaction to any treats. So I got a few things from the Halloween section from Oriental Trading like the Teal pumpkin, some fadeless black paper, and glow in the dark paint. I also picked up one of their treasure chest grab bags to hand out to the allergy-friendly children. 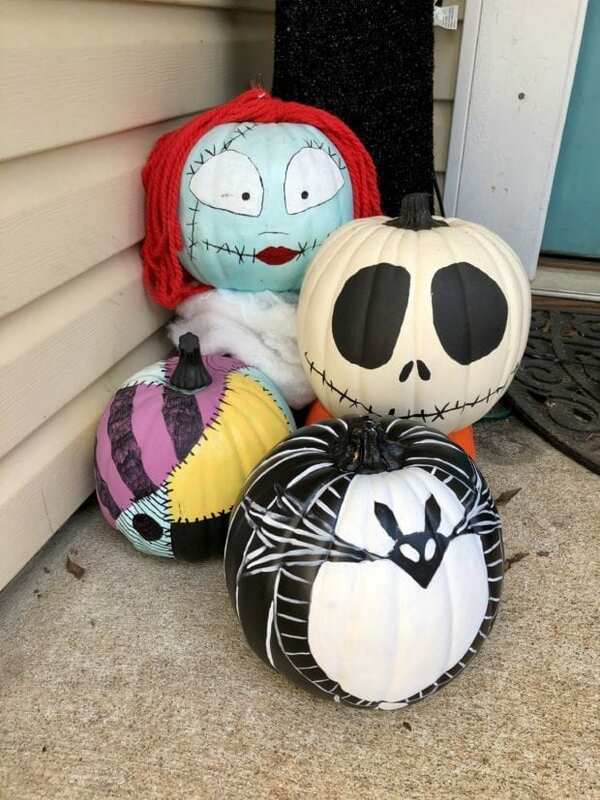 I also picked up a white and black craft pumpkins and some paint to paint my pumpkins into Jack Skellington and Sally. 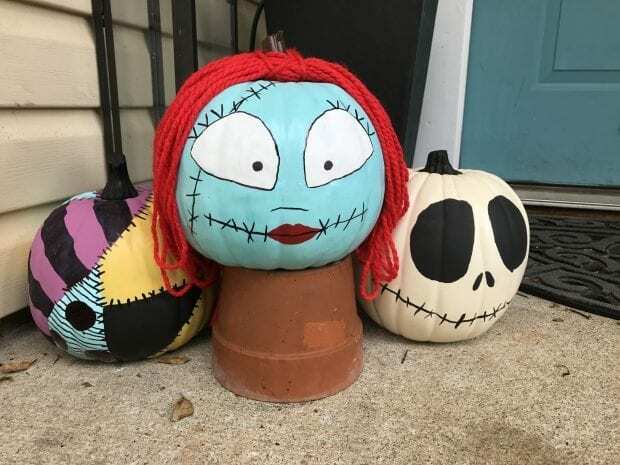 With the teal pumpkin, I painted Sally's face onto it and used the red yarn for her hair. I also made a separate pumpkin to look like her dress because she is one of my all-time Disney / Tim Burton characters. The white pumpkin I simply painted his face and stem white to look like a skeleton head. The black pumpkin I painted to look like Jack's suit. For the Oogie Boogie's silhouette in the window, I created a fun moon that I can hang like a wreath. He is the perfect addition to my Nightmare Before Christmas decor. 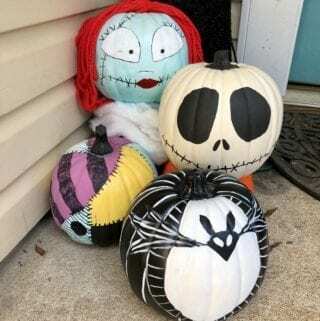 He looks great with the Jack and Sally pumpkins. I love that they are all made of great materials that I can pack away and use again year after year. I think next year I'll create a cute little Zero out of an old sheet. That will make this project just perfect. For now, I'll break out my Sally costume again this year at Walt Disney World. Paint Eyes, Stitches, and a mouth on a teal pumpkin. Create a wig by winding the yarn up at twelve inches long. Secure it in the center with a smaller piece of yarn. Place around the stem of the pumpkin. Using a Black Sharpie, draw patches onto a teal pumpkin. Paint some of the patches purple and yellow. Make sure to leave some of the patches teal. Allow to dry completely. Paint black eyes and smile on a white pumpkin. Using a pencil, sketch Jack's suit and bowtie onto the pumpkin. Using white paint, create a wide triangle as Jack's chest. Make sure not to paint hit bowtie. Add lines for the collar and pinstripes for the rest of his suit. I was provided with the supplies to make these cute crafts from Oriental Trading.